It is important that your poodle has a healthy diet through quality pet food. Whether you have a standard poodle, a miniature poodle, a toy poodle, or pure pedigree poodle puppies, our poodle’s skin and coat are beautiful and need to be protected. The poodle is a dog breed that has a nice figure but must also be protected—many suffer from a food allergy. A great diet can make a world of difference, even though they can be very picky eaters. 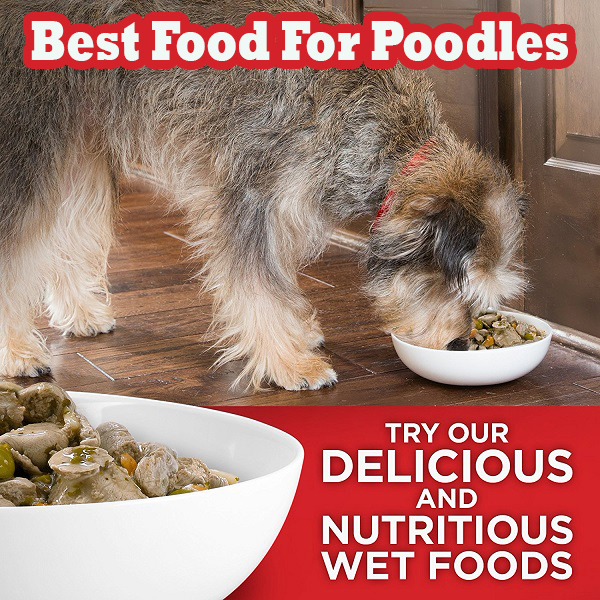 When finding the best food for poodles, you must look at the particular diet you are feeding while also getting the right foods that are suitable for your dog to have as they may have allergies. This is to give your dog more control over how well their body is developing and how strong the dog can be. The calories your dog needs will vary based on how active your dog is. A relatively inactive poodle needs about 1,200 calories per day. A more active one can take in about 1,500 calories. About 18 to 21% of your dog’s diet should come from protein. This is to help provide your dog with healthy muscles. Food must not contain any artificial colors. This can get in the way of the ingredients that your dog needs. These can also cause your dog’s coat to become discolored over time. Grains that contain carbohydrates like brown rice and whole oats work well, though some owners prefer grain free raw food. These are easier for your poodle to digest than other grains. The meats that are included need to be authentic. Proper meat meal should be made from real meat sources without byproducts like random organics or other body parts that are typically not consumed. This is regardless of the type of meat that is being used although it is even more important for chicken, given how the chicken has more byproduct parts that can be used. Don’t forget that some of the foods you will come across include a number of choices that are for dogs at certain stages in their lives. These include puppy foods, adult foods and senior foods. While it is true that a dog that is a little older in age could use an adult or senior food, you should still look carefully at the needs your poodle has over time. This is so your dog will only have the healthiest possible foods in store. 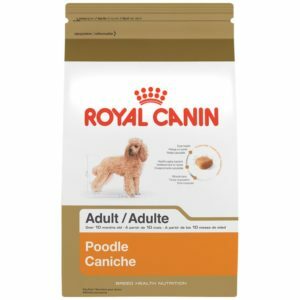 With all of these points in mind, let us take a look at some options that you can use when getting the best possible food for your poodle. Royal Canin has made a number of dog foods with individual breeds in mind. The poodle food mix from the company is designed to help promote a healthy coat while also improving upon your dog’s muscle tone. 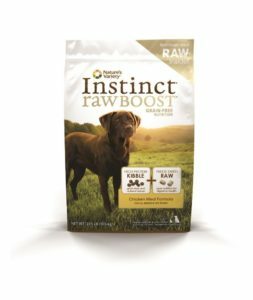 This food particularly contains added protein to help build upon the dog’s muscles. DHA is also included to help improve upon the dog’s brain and eye health. The kibble bits used is also shaped to be tougher for the dog to chew. This encourages the development of strong and healthy teeth. 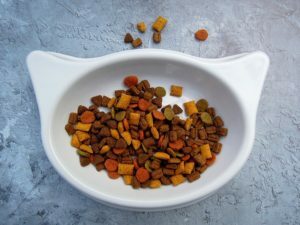 It also makes it so the dog will have to cut down the kibble bits into smaller sizes, thus making it easier for them to be processed and consumed correctly. Venison meal is a critical ingredient for your poodle to enjoy. Venison has more protein to support your dog’s fancy coat. Omega-3 fatty acids are added to support your dog’s coat. Linoleic acid, zinc, and copper are also included. Soybean meal is a key part of the food as well. This is an organic whole grain protein that contains healthy carbohydrates for energy while still being very easy to digest. More importantly, the venison meal is made with pure meat in mind. It does not contain any byproducts that might be unhealthy. This is a chicken meal food that is grain-free. The chicken meal comes from real chicken sources that have been fully deboned and do not contain any risky byproducts. It even has a few freeze-dried raw bits of food. 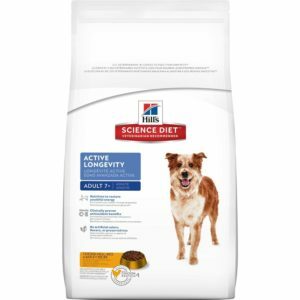 This offers a healthy setup that is easy for your dog to digest. Omega-3 and omega-6 fatty acids are added to improve upon your dog’s coat. These also assist in improving upon your dog’s blood flow as it regulates how fats move about the body. This product is available in a variety of other flavors too. You can find this with beef, duck, lamb, or venison ingredients. The product is made with the same standards all around with a strict emphasis there being no artificial ingredients or colors anywhere in the food. Probiotics are also included to help improve upon how well the food can be digested. Your dog will not struggle with trying to consume the food when the proper probiotics are added. This next option for poodles is designed for dogs of seven years of age or older but it could also be used by dogs that are a little younger. It includes vitamins C and T to improve upon the dog’s immune system. It also contains healthy antioxidants that clear up your dog’s skin and coat, thus restoring its natural shine and look over time. These antioxidants also help to improve upon how your dog’s immune system runs. It also has amino acids to build healthy muscle fibers. 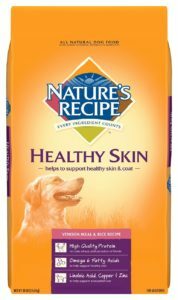 This adds a comfortable look to your dog’s body and should not be too rough or hard to apply. It has kibble bits that are carefully designed to break down with ease so they are easier for your dog to digest. This makes them capable of improving upon your dog’s teeth like dry food would while still being easy to break down and consume like what wet food already has. Watch for how you are feeding your poodle. Be certain that you are getting healthy foods for your poodle so it will be easier for your dog to have a great coat and be maintain the ideal weight for a long and healthy life.